Whether for a trade show, walk-a-thon, corporate event, or for any type of public awareness effort here are some useful giveaway ideas. After all, every step counts when you are venturing to increase sales. 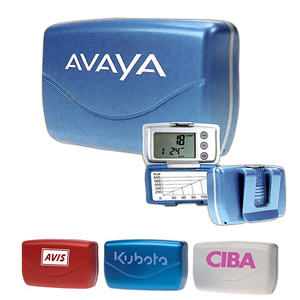 Consider a promotional pedometer for your next campaign. Wear a pedometer on your belt or waistband to record the steps you take everyday. Some multifunction pedometers like the Deluxe Multi-Function Pedometer count the total steps taken, distance traveled, calorie consumption, date and time. A pedometer serves as a motivational tool for people starting a walking program. Walking encourages weight loss, improves cardiovascular fitness, lowers blood pressure and decreases the risk of disease. By this time of year most people need a resolution rescue, an imprinted pedometer may be just what your clients needs to get moving. Or promote health and wealth with other fitness items. Search keyword: pedometer at garrettspecialties.com for related products.